This article by James Scourse, Professor of Marine Geology at the School of Ocean Sciences and Director of the Climate Change Consortium of Wales, was originally published on The Conversation. Read the original article. At a public seminar at a respected university in Scandinavia on how to promote cross-disciplinary research last year, the dean of one of the faculties passed the comment that “now we are living in the Anthropocene, everything we see around us, everything in our environment, we realise is the result of human activity”. This, of course, is nonsense. The reach of human activity is demonstrably profound, affecting nearly all biogeochemical cycling within the Earth system, but to attribute all the changes we observe to human activity is wrong; humanity has no control over the output of solar radiation by the sun, the astronomical position of the Earth, or the internal processes that drive plate tectonics and volcanic activity. All three profoundly influence humans but operate entirely independently from human activity. I could have chosen many other examples. The sad fact is that the adoption of the term Anthropocene – informal, as yet, but nevertheless clearly viral – is misleading. But it is worse than that; it has stimulated a redundant, manufactured, debate that displaces more important scientific research and genuine discussion on climate and environmental change. It is a fad, a bandwagon, a way of marketing research as cutting-edge and relevant. At its worst it can be seen as a disingenuous means of harvesting citations under the guise of serious endeavour. 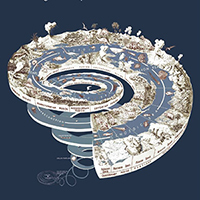 Do we need to add to the geological time spiral? : US Geological Survey http://pubs.usgs.gov/gip/2008/58/The term Anthropocene was first proposed back in 2000 by atmospheric chemist Paul Crutzen and Eugene Stoermer, a biologist, to denote the recognition that humans are now profoundly altering the Earth’s climate system and environment. So profoundly, in fact, that Earth scientists should name a new epoch of geological time to register this impact. The naming of chunks of geological time was necessary, particularly so before the dawn of radiometric dating and other ways of directly measuring the age of rocks. Back then, there was no choice. Names such as “Cambrian” and “Pleistocene” were invented and the time period they represented were defined in layers of rocks. All this remains important. But it is always only a means to an end, a methodological step that ultimately helps Earth scientists to do what they should be doing; that is, to understand the fundamental processes and mechanisms that make the Earth what it is. Studying and naming layers of rock – stratigraphy – is not an end in itself, though reputations are made, and medals won, in deciding how the cake should be cut and what all the individual pieces should be called. The term is now up for formal ratification by a subcommision of the International Commission on Stratigraphy (ICS) which requires the Anthropocene’s base – when it started – to be defined. So there is now a “debate” to decide where this base should be. Is it the transition from hunting to farming, the moment Columbus arrived in America, the industrial revolution, or perhaps atomic weapons testing in 1960? Without such a defined base, there can be no epoch. No doubt this debate will run and run and an Anthropocene Working Group is considering the matter and their latest contribution – a lengthy review that rehearses the various candidates for the base of the Anthropocene – has just been published in Science. Quite apart from the difficulty of defining the base – the issue that so obsesses the anthropocenists – the term serves no useful purpose since it is not necessary for defining the rock record. There are plenty of ways of measuring time and establishing stratigraphies for the epoch when humans have progressively impacted the Earth system, such as measuring tree rings, radioisotopes introduced by atomic weapons testing, or counting annual layers in ice cores. We use these tools on a daily basis and have no need for the new term. And while the anthropocenists rearrange the deck chairs, other scientists are getting on with the business of trying to understand, and do something, about the crisis we face.